Branch, A., Monasterio, A., Blair, G., Knierim, J. J., Gallagher, M., & Haberman, R. P. (2019). Aged rats with preserved memory dynamically recruit hippocampal inhibition in a local/global cue mismatch environment. Neurobiology of Aging. doi: https://doi.org/10.1016/j.neurobiolaging.2018.12.015. Chung, Y., Buechel, B. D., Sunwoo, W., Wagner, J. D., & Delgutte, B. (2019). Neural ITD Sensitivity and Temporal Coding with Cochlear Implants in an Animal Model of Early-Onset Deafness. Journal of the Association for Research in Otolaryngology. doi: 10.1007/s10162-018-00708-w.
Ganeshan, V., Skladnev, N. V., Kim, J. Y., Mitrofanis, J., Stone, J., & Johnstone, D. M. (2019). Pre-conditioning with Remote Photobiomodulation Modulates the Brain Transcriptome and Protects Against MPTP Insult in Mice. Neuroscience, 400, 85-97. doi: https://doi.org/10.1016/j.neuroscience.2018.12.050. MBF Bioscience Williston, VT – January 9, 2019 – MBF Bioscience is pleased to announce our participation in the Stimulating Peripheral Activity to Relieve Conditions (SPARC) program. Funded by the National Institutes of Health (NIH), this extensive research initiative is a vast collaborative effort, which aims to deepen the understanding of how the peripheral nervous system impacts internal organ function. “We are honored to be working in collaboration with over 40 research teams in the United States and around the world who are making revolutionary discoveries about how the network of nerves located outside the brain and spinal cord affect organs such as the heart, stomach, and bladder, and what role these nerves play in diseases like hypertension and type II diabetes as well as gastrointestinal and inflammatory disorders,” says Jack Glaser, President of MBF Bioscience. To facilitate this important research, MBF Bioscience will provide the collaborating research scientists with both software and support. Specifically, we will provide image segmentation tools developed to handle large and diverse amounts of scientific image data. Software applications such as Neurolucida 360®, Tissue Mapper™ and Tissue Maker™ will enable researchers to image and analyze nerves, tissues, and entire organs in 2D and 3D. “Representing the innervation patterns accurately and robustly is an essential contribution to the generation of representative models that can be used for simulations. We are working with our partners at the University of Auckland, under the direction of Professor Peter Hunter, to create these models for each organ system that will be an enduring resource for scientists for years to come,” says Susan Tappan, Scientific Director at MBF Bioscience. Researchers involved in the SPARC program are making important advances in health and medicine, which may lead to the development of new therapies for managing an array of illnesses and disorders. Some examples of research areas include subcutaneous nerve stimulation for arrhythmia control, sensory neuromodulation of the esophagus, and mapping of the neural circuitry of bone marrow. We are thrilled about this opportunity to work in partnership with such an impressive array of research teams on this ground-breaking project. Our commitment to innovative products and unrivaled customer support has gained high praise from distinguished scientists all over the world and resulted in MBF expanding into a global business with offices in North America, Europe, Japan, and China. Our flagship products, Stereo Investigator® and Neurolucida®, are the most widely-used analysis systems of their kind. Stimulating Peripheral Activity to Relieve Conditions (SPARC) is a National Institutes of Health (NIH) program that focuses on understanding peripheral nerves — nerves that connect the brain and spinal cord to the rest of the body — and how their electrical signals control internal organ function. Methods and medical devices that modulate these nerve signals are a potentially powerful way to treat many diseases and conditions, such as hypertension, heart failure, gastrointestinal disorders, type II diabetes, inflammatory disorders, and more. Kumar, A. J., Motta-Teixeira, L. C., Takada, S. H., Lee, V. Y., Machado-Nils, A. V., Xavier, G. F., & Nogueira, M. I. (2018). Behavioral, cognitive and histological changes following neonatal anoxia: male and female rats’ differences at adolescent age. International Journal of Developmental Neuroscience. doi: https://doi.org/10.1016/j.ijdevneu.2018.12.002. Martínez Cerdeño, V., Hong, T., Amina, S., Lechpammer, M., Ariza, J., Tassone, F., . . . Hagerman, R. (2018). Microglial cell activation and senescence are characteristic of the pathology FXTAS. Movement Disorders, 0(0). doi: 10.1002/mds.27553. Osipovitch, M., Asenjo Martinez, A., Mariani, J. N., Cornwell, A., Dhaliwal, S., Zou, L., . . . Goldman, S. A. (2018). Human ESC-Derived Chimeric Mouse Models of Huntington’s Disease Reveal Cell-Intrinsic Defects in Glial Progenitor Cell Differentiation. Cell Stem Cell. doi: https://doi.org/10.1016/j.stem.2018.11.010. Chaaya, N., Jacques, A., Belmer, A., Richard, D. J., Bartlett, S. E., Battle, A. R., & Johnson, L. R. (2018). Localization of Contextual and Context Removed Auditory Fear Memory within the Basolateral Amygdala Complex. Neuroscience. doi: https://doi.org/10.1016/j.neuroscience.2018.12.004. Aldehri, M., Temel, Y., Jahanshahi, A., & Hescham, S. (2018). Fornix deep brain stimulation induces reduction of hippocampal synaptophysin levels. Journal of Chemical Neuroanatomy. doi: https://doi.org/10.1016/j.jchemneu.2018.12.001. Carrica, L., Li, L., Newville, J., Kenton, J., Gustus, K., Brigman, J., & Cunningham, L. A. (2019). Genetic inactivation of hypoxia inducible factor 1-alpha (HIF-1α) in adult hippocampal progenitors impairs neurogenesis and pattern discrimination learning. Neurobiology of Learning and Memory, 157, 79-85. doi: https://doi.org/10.1016/j.nlm.2018.12.002. Fowke, T. M., Galinsky, R., Davidson, J. O., Wassink, G., Karunasinghe, R. N., Prasad, J. D., . . . Dean, J. M. (2018). Loss of interneurons and disruption of perineuronal nets in the cerebral cortex following hypoxia-ischaemia in near-term fetal sheep. Scientific Reports, 8(1), 17686. doi: 10.1038/s41598-018-36083-y. Beldick, S. R., Hong, J., Altamentova, S., Khazaei, M., Hundal, A., Zavvarian, M.-M., . . . Fehlings, M. G. (2018). Severe-combined immunodeficient rats can be used to generate a model of perinatal hypoxic-ischemic brain injury to facilitate studies of engrafted human neural stem cells. Plos one, 13(11). doi: 10.1371/journal.pone.0208105. Guimarães, M. R., Soares, A. R., Cunha, A. M., Esteves, M., Borges, S., Magalhães, R., . . . Leite-Almeida, H. (2018). Evidence for lack of direct causality between pain and affective disturbances in a rat peripheral neuropathy model. Genes, Brain and Behavior, 0(ja), e12542. doi: 10.1111/gbb.12542. Killoran, K. E., Kropp, L. E., Lindrose, A. R., Curtis, H. E., Cook, D., & Mitre, E. (2018). Rush desensitization with a single antigen induces subclinical activation of mast cells and protects against bystander challenge in dually sensitized mice. Clinical and Experimental Allergy, 0(ja). doi: 10.1111/cea.13323. Buchman, A. S., Leurgans, S. E., VanderHorst, V. G. J. M., Nag, S., Schneider, J. A., & Bennett, D. A. (2018). Spinal motor neurons and motor function in older adults. Journal of Neurology. doi: 10.1007/s00415-018-9118-y. Chew, C., Kiley, B. J., & Sengelaub, D. R. (2018). Neuroprotective effects on the morphology of somatic motoneurons following the death of neighboring motoneurons: A role for microglia? Developmental Neurobiology, 0(ja). doi: 10.1002/dneu.22652. Karasawa, M., Yokouchi, K., Kawagishi, K., Moriizumi, T., & Fukushima, N. (2018). Effects of various lengths of hypoglossal nerve resection on motoneuron survival. Journal of Clinical Neuroscience. doi: https://doi.org/10.1016/j.jocn.2018.11.020. Castillo-Ruiz, A., Mosley, M., Jacobs, A. J., Hoffiz, Y. C., & Forger, N. G. (2018). Birth delivery mode alters perinatal cell death in the mouse brain. Proceedings of the National Academy of Sciences. doi: https://doi.org/10.1073/pnas.1811962115. Chen, Y.-H., Lee, H.-J., Lee, M. T., Wu, Y.-T., Lee, Y.-H., Hwang, L.-L., . . . Chiou, L.-C. (2018). Median nerve stimulation induces analgesia via orexin-initiated endocannabinoid disinhibition in the periaqueductal gray. Proceedings of the National Academy of Sciences. doi: https://doi.org/10.1073/pnas.1807991115. Garcia-Miralles, M., Yusof, N. A. B. M., Tan, J. Y., Radulescu, C. I., Sidik, H., Tan, L. J., . . . Pouladi, M. A. (2018). Laquinimod Treatment Improves Myelination Deficits at the Transcriptional and Ultrastructural Levels in the YAC128 Mouse Model of Huntington Disease. Molecular Neurobiology. doi: 10.1007/s12035-018-1393-1. Issa, H. A., Staes, N., Diggs-Galligan, S., Stimpson, C. D., Gendron-Fitzpatrick, A., Taglialatela, J. P., . . . Sherwood, C. C. (2018). Comparison of bonobo and chimpanzee brain microstructure reveals differences in socio-emotional circuits. Brain Structure and Function. doi: 10.1007/s00429-018-1751-9. Jiang, Y., Cao, Z., Ma, H., Wang, G., Wang, X., Wang, Z., . . . Feng, T. (2018). Auricular Vagus Nerve Stimulation Exerts Antiinflammatory Effects and Immune Regulatory Function in a 6-OHDA Model of Parkinson’s Disease. Neurochemical Research, 43(11), 2155-2164. doi: 10.1007/s11064-018-2639-z. Nuber, S., Rajsombath, M., Minakaki, G., Winkler, J., Müller, C. P., Ericsson, M., . . . Selkoe, D. J. (2018). Abrogating Native α-Synuclein Tetramers in Mice Causes a L-DOPA-Responsive Motor Syndrome Closely Resembling Parkinson’s Disease. Neuron, 100(1), 75-90.e75. 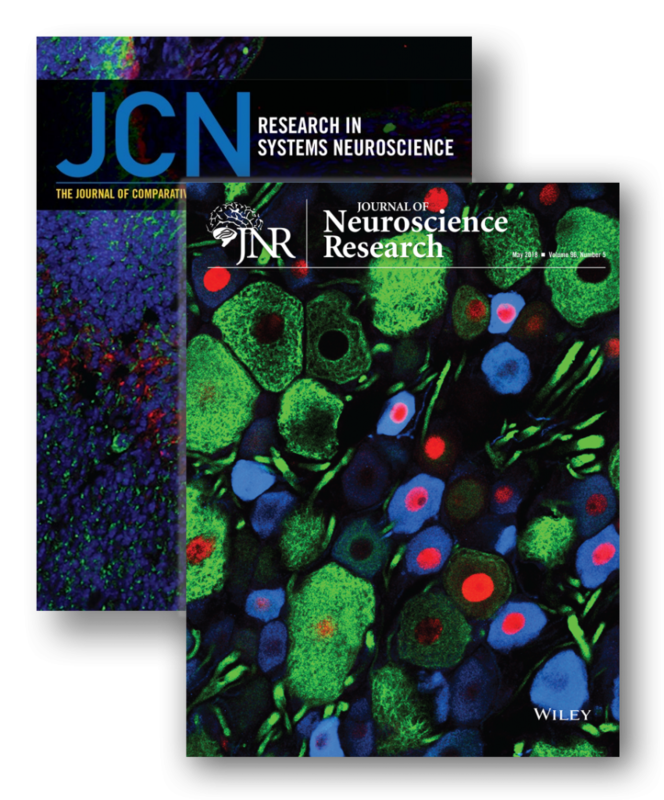 doi: https://doi.org/10.1016/j.neuron.2018.09.014. Dufour, B. D., & McBride, J. L. (2019). Normalizing glucocorticoid levels attenuates metabolic and neuropathological symptoms in the R6/2 mouse model of huntington’s disease. Neurobiology of Disease, 121, 214-229. doi: https://doi.org/10.1016/j.nbd.2018.09.025. Heermann, T., Garrett, L., Wurst, W., Fuchs, H., Gailus-Durner, V., Hrabě de Angelis, M., . . . Hölter, S. M. (2018). Crybb2 Mutations Consistently Affect Schizophrenia Endophenotypes in Mice. Molecular Neurobiology. doi: 10.1007/s12035-018-1365-5. Hussain, T., Kil, H., Hattiangady, B., Lee, J., Kodali, M., Shuai, B., . . . Aldaz, C. M. (2019). Wwox deletion leads to reduced GABA-ergic inhibitory interneuron numbers and activation of microglia and astrocytes in mouse hippocampus. Neurobiology of Disease, 121, 163-176. doi: https://doi.org/10.1016/j.nbd.2018.09.026. Maxan, A., Mason, S., Saint-Pierre, M., Smith, E., Ho, A., Harrower, T., . . . Cicchetti, F. (2018). Outcome of cell suspension allografts in a patient with Huntington’s disease. Annals of Neurology, 0(ja). doi: 10.1002/ana.25354. Anselmi, L., Bove, C., Coleman, F. H., Le, K., Subramanian, M. P., Venkiteswaran, K., . . . Travagli, R. A. (2018). Ingestion of subthreshold doses of environmental toxins induces ascending Parkinsonism in the rat. Npj Parkinson’s Disease, 4(1), 30. doi: 10.1038/s41531-018-0066-0. Bauman, M. D., Schumann, C. M., Carlson, E. L., Taylor, S. L., Vázquez-Rosa, E., Cintrón-Pérez, C. J., . . . Pieper, A. A. (2018). Neuroprotective efficacy of P7C3 compounds in primate hippocampus. Translational Psychiatry, 8(1), 202. doi: 10.1038/s41398-018-0244-1. Cope, E. C., Opendak, M., LaMarca, E. A., Murthy, S., Park, C. Y., Olson, L. B., . . . Gould, E. (2018). The effects of living in an outdoor enclosure on hippocampal plasticity and anxiety-like behavior in response to nematode infection. Hippocampus, 0(ja). doi:10.1002/hipo.23033. Ellwardt, E., Pramanik, G., Luchtman, D., Novkovic, T., Jubal, E. R., Vogt, J., . . . Stroh, A. (2018). Maladaptive cortical hyperactivity upon recovery from experimental autoimmune encephalomyelitis. Nature Neuroscience, 21(10), 1392-1403. doi: 10.1038/s41593-018-0193-2.